OLPC is working in 9 schools and 5 cities in Afghanistan. Many of the schools have some limited Internet connectivity at home, but most families still don’t have Internet (though they may get GPRS coverage if they have access to a cell phone) in their neighborhoods or home compounds. In Jalalabad, this is changing in part thanks to a mesh network run by FabLab Jalalabad. Through their FabFi network, many children with XOs and their families have access to the Internet (and Wikipedia) for the first time. Fast Company wrote up a good story on this, following the New York Times’s lead last Sunday (commentary). Similar FabLabs with mesh networks have sprung up elsewhere, most notably in Kenya. I hope to see them spread more widely in Africa and Asia – it seems like a robust and scalable model for engaging communities in maintaining their own networks. Happy new year to the OLPC community around the world! Thank you for your part in everything we have accomplished in 2010 – from our new initiatives in Gaza, Argentina, and Nicaragua to expansion of work in Peru, Uruguay, Rwanda, Mexico, Afghanistan, and Haiti. Special thanks to everyone who has worked on the newest iterations of Sugar, and those who put on the grassroots events over the past year in the Virgin Islands, San Francisco, and Uruguay — all of which has helped connect some of our smaller projects and realize some of their educational dreams in new activities. We’ve launched our new website for the year, highlighting the stories from these and other deployments; this blog may merge into that site as well (and you can see blog posts appearing in its News section). With roughly 4,000 laptops deployed, we’re still in the beginning stages of the initiative. It’s a good stage to be in, especially for building our technical support in advance. So what’s the best way of doing that? One idea that has been proposed: setting up partnerships with students at Afghan universities. We’d recruit teams of student volunteers to provide ongoing support to teachers and pilot projects. Throughout the whole process, OLPC would provide ongoing support, feedback, access to spare parts and technical advice. Of course there are still a lot of details to iron out. Right now we’re planning to call it the Afghanistan Children’s Connectivity Project, involving individual Connectivity Centers in community hubs in each region. This year, the United States Government requested $105.9 billion for military operations in Afghanistan. The numbers break down into $68.1 billion requested by the Department of Defense for 2010 and a $33 billion supplement requested by the Administration to support the 30,000 person troop surge in the area. It’s funny to think that providing every child in the country with an XO would cost about $800 million — or 3 days of that military spending. In early May, Save the Children‘s State of the World’s Mothers 2010 report ranked Afghanistan last among the 160 countries surveyed, in terms of how easy it was to raise children. While medical care is often limited, and being an infant in Afghanistan poses many risks, it is also a tough place to grow up. Only 52% of primary aged school children are enrolled in school, where classes are often made up of more than fifty students. Despite the extraordinary restoration of public schools and teachers over the past decade, there is still a lack of teachers and school buildings, and children receive an average of 2.5 hours of school a day. That is half of what children in developed nations (OECD) receive. These numbers reflect a vast improvement from when the Taliban controlled the country – over the past three years, school enrollment has grown from 800,000 students to 4.5 million. But youthful curiosity is not bounded by time spent in school. We are working to make sure that, district by district, these children have tools and projects to explore and to experiment with, so they can have time to learn even when school does not have time for them. Note: Some information comes from the latest OLPC Afghanistan Briefing Note. This past weekend, OLPC Afghanistan reached Baghlan province, working with the Ministry of Education’s deployment team to provide XOs to 280 children and teachers in grades 4-6 at Firdausi High School. (In Afghanistan a ‘high school’ can refer to any school whose upper grades reach past 9th grade, but can include students in 1st grade as well.) Firdausi becomes the seventh school in the country to take part in the Ministry pilot program. The Ministry is working on plans for extending this early work into full-saturation regional or national efforts. The Firdausi project will integrate the XOs into the school’s teacher planning and curricula, as well as in after-school projects. They may be used outside of school by families to access training, job information, and resources to develop and improve farms and small businesses. 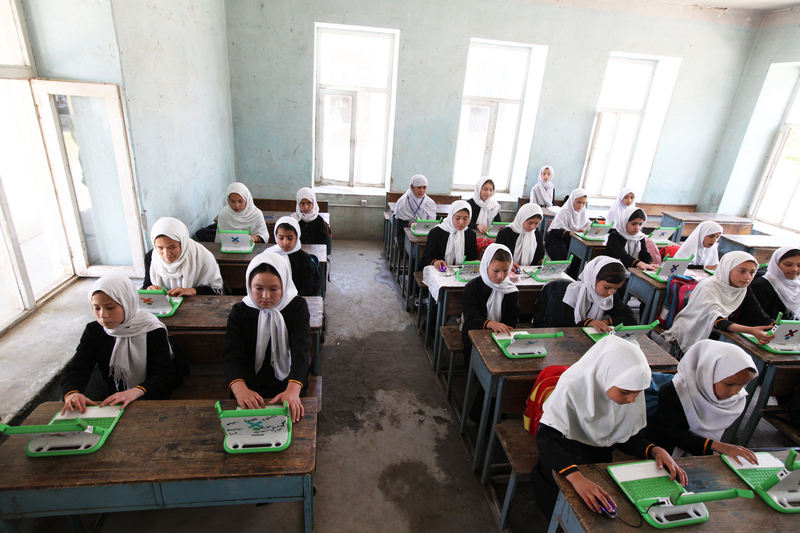 Since 2008, we have worked with the Afghan Ministry of Education to build capacity for OLPC in Afghanistan. The initial pilots over the past year have been with 4th-6th grade students, in MOE schools and community-based education groups. OLPC has committed 5,000 laptops to pilots throughout the country, starting with Esteqlal High School in Nangarhar Province’s Jalalabad city. There the program engaged all fourth, fifth and sixth grade students, with a ‘3 phase implementation model’ (below) used by the ministry. The next project involved five schools in Kabul city. Initial feedback has unfortunately only been measured in terms of standardized test results (in math and literacy), but initial results showed a 20% increase on those tests. In the coming months, national team plans to include schools in other provinces. They also aim to recruit and train more technical people to help with planning and preparing teachers and connectivity teams for schools across the country.